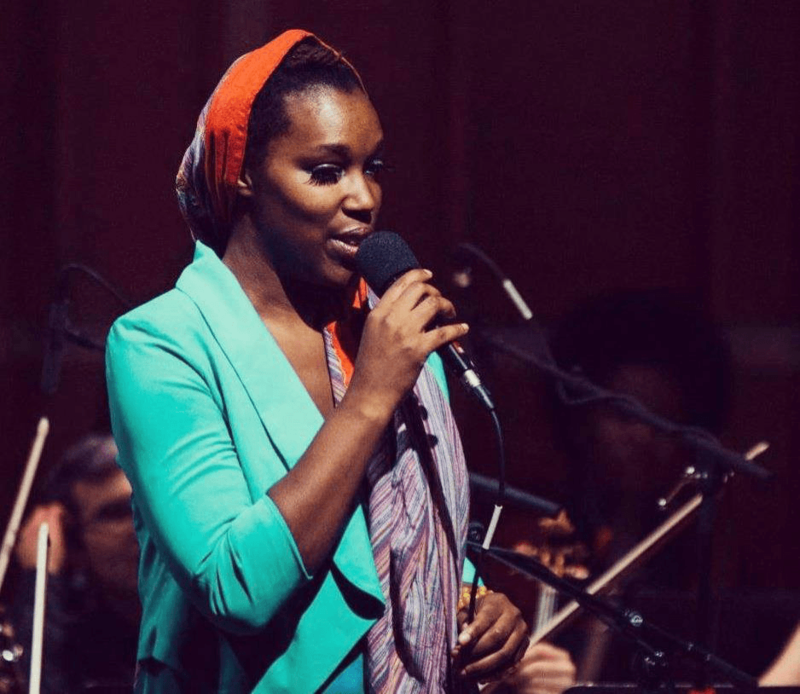 Vocalist, composer and cultural worker Imani Uzuri has been called "a post modernist Bessie Smith" by The Village Voice. Uzuri creates music that reflects her North Carolina roots where she grew up singing Spirituals and line-singing hymns with her grandmother and extended family in their small rural church. Uzuri's music also highlights her affinity for her African American cultural musical practices like antiphony, polyrhythms and the use of melisma, guttural sounds and moans. She has recently been praised in the New York Times for her "gorgeously chesty ruminations". Her compositions for bands, choral ensembles, chamber orchestra, musical theater and solo voice also include influences from her travels around the world to places like Hungary, Morocco, Ethiopia, Russia, Kazakhstan and Japan where she shared these foundational American musical sounds with international audiences and communities while also learning about their musical traditions. Uzuri's new album, The Gypsy Diaries, draws on her roots as well as influences ranging from Sufi devotionals to Romany laments. Her ensemble features unique instrumentation combining sitar, acoustic guitar, cello, Japanese shinobue flute, and Persian percussion. It is a vibrant lyrical and spiritual sound scape that reached #2 on Rhapsody's World Music Top 10. Uzuri's work has been called "stunning" by New York Magazine and incorporates her interests in world culture, improvisation and sacred music. She creates and performs concerts, experimental theater, performance art, theater compositions and sound installations in international venues/festivals including Lincoln Center Out of Doors Festival, New York's Central Park SummerStage, Joe's Pub,The Kitchen, Blue Note Jazz Club, Whitney Museum, Performa Biennial, France's Festival Sons d'hiver, London's ICA and MoMA (Museum of Modern Art) and Canada's Banff International Workshop in Jazz and Creative music where she was also an invited faculty member for voice and composition. Uzuri has collaborated with a wide range of noted artists across various artistic disciplines including musicians Herbie Hancock, John Legend, Vijay Iyer; visual artists Wangechi Mutu, Carrie Mae Weems, Sanford Biggers; choreographer Trajal Harrell and composer Robert Ashley. Her television credits include a feature on BET for their Black History Month campaign and Late Night with Jimmy Fallon performing with Talib Kweli, Hi Tek and The Roots. She was recently the featured performer at TED@250 Salon on Belief and Doubt which included speakers Anthony Appiah and Naomi Oreskes. The Village Voice says,“With a voice that would sound equally at home on an opera stage or a disco 12-inch, Imani Uzuri is a constant surprise...seamlessly combining jazz, classical, country and blues motifs into highly personalized compositions." The New Yorker recently named Uzuri one of the emerging “female composers edg[ing] forward” and Time Out New York says, "[Imani Uzuri] never fails to mesmerize audiences with her narcotic blend of…ethereal sounds". Uzuri is creating a new cantata, Conjure Woman, to receive its World Premiere at the 2015 Avant Music Festival.